Last season the Friends of HFP were VERY productive and we've added a second (and will be adding a third and fourth) page of content in this section to keep things clean and make the pages load easier. On this page we'll continue to load comedies, like "Issues" starring David Daskal. If you've got a comedy that needs more exposure visit the "Contact Us" page to find out how to submit it for consideration. WARNING: Strong Adult Language, Violence, and Strong Adult Content. Viewer discretion is advised. Darryl Jenkins discovers new music. Free subscribe to http://www.youtube.com/issues2012 to catch wind of new episodes. On facebook: http://www.facebook.com/issuestvshow . 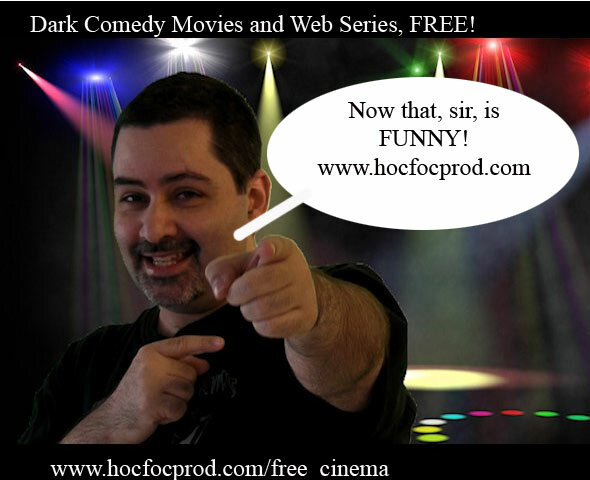 When you drop by the YouTube page or add them on Facebook let them know you found them in the HFP Free Cinema. The Final Episode of the season to The League of Science! The Shape has learned that Dr. Devokees has been sabotaging the experiments, this time he's out for blood! Visit the League's YouTube page for behind the scenes stuff and "half season" specials. WARNING: Strong Adult Language, Violence, and Strong Adult Content. Viewer discretion is advised. Darryl Jenkins tries to meet his friend Thomas McClintock for lunch. Free subscribe to http://www.youtube.com/issues2012 to catch wind of new episodes. On facebook: http://www.facebook.com/issuestvshow . WARNING: Strong Adult Language, Violence, and Strong Adult Content. Viewer discretion is advised. Darryl Jenkins celebrates his birthday in public. Free subscribe to http://www.youtube.com/issues2012 to catch wind of new episodes. On facebook: http://www.facebook.com/issuestvshow . WARNING: Strong Adult Language, Violence, and Strong Adult Content. Viewer discretion is advised. Darryl Jenkins wants to see a MMA fight. Free subscribe to http://www.youtube.com/issues2012 to catch wind of new episodes. On facebook: http://www.facebook.com/issuestvshow . WARNING: Strong Adult Language, Violence, and Strong Adult Content. Viewer discretion is advised. Darryl Jenkins is ready to head to Nevada. Free subscribe to http://www.youtube.com/issues2012 to catch wind of new episodes. On facebook: http://www.facebook.com/issuestvshow . WARNING: Strong Adult Language, Violence, and Strong Adult Content. Viewer discretion is advised. Darryl Jenkins is now jam-packed ready to head to Nevada with Neighbor Keanu River. Free subscribe tohttp://www.youtube.com/issues2012 to catch wind of new episodes. On facebook: http://www.facebook.com/issuestvshow . Episode 5.5 takes place after episode 5 and before episode 6. This time the experiment is Sesame Street, so get ready and watch some League of Science! WARNING: Strong Adult Language, Violence, and Strong Adult Content. Viewer discretion is advised. Darryl Jenkins has his peeps over for Game Night. Free subscribe to http://www.youtube.com/issues2012 to catch wind of new episodes. On facebook: http://www.facebook.com/issuestvshow . Shocko Cartoon Show - Episode 1 ! The Shocko The Clown Show is now a half hour long series. Episode one features Attack Of The Giant Little Girl, Manos About Town and The Were-Do-Well. WARNING: Strong Adult Language, Violence, and Strong Adult Content. Viewer discretion is advised. Darryl Jenkins spots a celebrity. Free subscribe to ﻿http://www.youtube.com/issues2012﻿ to catch wind of new episodes. On facebook: ﻿http://www.facebook.com/issuestvshow﻿ . You may notice that all of the episodes of your favorite comedies aren't here. That's because we have to make room for the new ones and the page can only be so big and still load. So, visit the show's links to see older and newer episodes. WARNING: Strong Adult Language, Violence, and Strong Adult Content. Viewer discretion is advised. Darryl Jenkins tries to give another confession. Free subscribe to http://www.youtube.com/issues2012 to catch wind of new episodes. On facebook: http://www.facebook.com/issuestvshow . episode #2 of the shocko cartoon show features pickers of dracula, the astrosexuals and killer klown from next door. To see more Shocko and shower the clown with praise, visit his YouTube Channel direclty! WARNING: Strong Adult Language, Violence, and Strong Adult Content. Viewer discretion is advised. Darryl Jenkins is on a mission set forth by Father Morley. Free subscribe to http://www.youtube.com/issues2012 to catch wind of new episodes. On facebook: http://www.facebook.com/issuestvshow . Episode 3 includes Crimson Marriage Counseling, Armeghetti: Gunfight At The End Of The World, Lost In Sponsorship and House Of Shocko. WARNING: Strong Adult Language, Violence, and Strong Adult Content. Viewer discretion is advised. Darryl tries to drop off a mysterious package. Free subscribe to ﻿http://www.youtube.com/issues2012 ﻿to catch wind of new episodes. On facebook: ﻿http://www.facebook.com/issuestvshow﻿ . WARNING: Strong Adult Language, Violence, and Strong Adult Content. Viewer discretion is advised. Darryl gets things done on his off day. Free subscribe to ﻿http://www.youtube.com/issues2012﻿ to catch wind of new episodes. On facebook: ﻿http://www.facebook.com/issuestvshow﻿ . episode #5 includes shocko's all girl all night pajama party, carnival of insecurity and my totally freaking snazzy wedding. In this area we're hosting the comedies produced by other independent companies, which we think have merit and deserve your support. Follow the links within the descriptions to rate, comment on, a praise the shows. We encourage you to contact us about your indie comedy, sci-fi or horror web series, short or feature. The more filmmakers, producers and writers we bring together in one place, the more exposure everyone gets. We use your embedded stream so traffic for the videos registers to you.